Some types of soil are stronger than others. There are usually a number of different soil layers underneath a house. Foundation settlement can occur when one of these soil layers can't support the weight of the home. Your home is showing signs of damage related to foundation settlement. We fix foundation settlement issues by installing steel foundation piers. These piers will extend beneath the foundation, contacting strong supporting soils that will permanently stabilize your structure. At DBS, we solve foundation settlement issues of all kinds! Call us for a free foundation settlement repair quote today! As a foundation settles, many telltale signs will become evident. What follows are some of the most common ways that foundation settlement can become visible to the homeowner. Stair-step cracking is one of the surest signs of foundation settlement and is very common in brick in concrete block walls. As the settlement continues, vertical cracks may widen or become uneven as wall sections tilt away from each other, indicating more severe displacement. Sometimes a chimney is built on a footing that is not connected to the house foundation, making it even more at risk of settlement. More information about tilting, leaning chimney repair. An opening cut in any wall is a weak point, so signs of foundation settlement often show up around door and window openings located above settlement areas. Doors and windows frames may be racked out of square. Cracks may extend from the corners above doors and windows. Doors may separate from the framing or exterior finish. Other signs of foundation settlement include sticking, jamming doors and windows and locks that stop working. More information about sticking windows and doors. There are times when your slab floor may sink or lift independently of the foundation walls, damaging the floors but not necessarily the walls. More information about slab floor crack repair. At DBS, we recommend installing foundation piers to stabilize, repair, and restore a foundation that's been damaged by issues related to foundation settlement and poor supporting soils. There are several different types of foundation piers; each one is designed to address a different kind of foundation problem. We install three different kinds of foundation piers: push piers, helical piers, and slab piers. Push piers connect the foundation to strong, stable soil or bedrock. Foundation piers attach to the base of the foundation with special brackets and extend through settling and unstable soil layers, transferring the weight of your home to competent soils or bedrock. Foundation push piers are straight, steel piers that attach to your foundation and extend far below the structure to strong supporting soils. During the installation, a section of the foundation footing is exposed and cut to attach to each pier's bracket. This is possible from either inside or outside of your foundation. Foundation brackets are secured to the footing, and tubular pier sections are hydraulically driven through each bracket. Pier sections continue to be driven downwards until the piers meet competent strata. Read about our push pier system. Illustration of foundation helical piers stabilizing a home. Foundation helical piers are straight, steel piers that have helical blades welded to each shaft. This installation is possible from either inside or outside of your foundation. These piers are driven into the soils underneath your foundation, then each pier is connected to the structure's foundation via a steel bracket. Read about our helical pier system. Slab piers can stabilize a settling concrete slab. Slab piers are not appropriate for supporting foundation walls or repairing damage caused by foundation heave. Foundation slab piers are straight steel piers that extend from stable soils deep below the structure to support brackets directly in contact with the underside of the slab. These piers are meant to support a settling concrete floor and are not appropriate for foundation wall stabilization. Slab piers are also inappropriate for repairing heaving foundations. During installation, a small hole is cored through the concrete floor. A slab bracket is assembled beneath the concrete slab, and steel tubes are hydraulically driven down through this bracket. More about slab floor cracks and uneven floors. Read about our slab pier system. Like all home improvements and repairs, some methods work better than others. On the other hand, some methods seem to hardly work at all. In fact, at DBS, we find that many of our foundation repair jobs are actually just fixing the unsuccessful repairs of other contractors. A complete foundation replacement in Solon SPrings. The house is placed on temporary supports while the foundation is excavated and replaced. To completely replace your home's foundation, the soil will have to be removed from around your home and your home will be jacked up and placed on temporary supports. Next, your foundation walls are completely removed, and a new set of walls are constructed. This is expensive, time-consuming, and extremely disruptive for a family. Even worse, it doesn't even address the real problem -- the soils around your foundation. Many homeowners remove and replace their foundation without addressing the problem that caused the foundation issue in the first place. When this happens, they often find that after several years, they're facing the same problem all over again. At DBS, we address the problem with warrantied solutions that will fix your problem once and for all. Concrete underpinning failed to stabilize this house. Eventually, the homeowner had to invest in a different, more permanent solution for their home. To install concrete underpinning, the soils must be excavated from around the foundation. Larger concrete footings are poured beneath the existing footings. Once the concrete has cured, the soil is backfilled. When it comes to foundation footings, "bigger" is not necessarily "better." Most of the time, the underpinning will not extend beyond the problem soils under your home. If this is true, the larger footings you just paid for will continue to move and cause damage. Concrete shrinks as it cures, and small gaps can form between the new and old footings. Open gaps beneath a home are never a good thing! When concrete underpinning is installed and fails to solve the problem, it is much more expensive to repair. Before installing a new foundation system, all that added concrete will need to be removed. Concrete piers are too big and blunt to be driven deep into foundation soils, so they usually don't extend to competent supporting soils. These piers can crack under pressure, and they often install unevenly or crookedly under your home. To install concrete piers under a home, the soil will first need to be excavated from around your foundation. Short, 6"-8"wide concrete cylinders are then pushed into the soil on top of one another, strung together by a wire. Shims are then placed between the top of the concrete pier and the footing, then the soil is backfilled. Blunt, wide concrete cylinders are difficult to push deep into the ground, making it very difficult to extend them past the poor supporting soils under your home. Concrete can crack and break when under pressure, and even in response to temperature changes, making concrete piers a flimsy repair method. Additionally, there is nothing to guide the direction for the pier, which means they might not be installed straight. So how will they support your home? Because of these and other reasons, very few companies will recommend this kind of approach. We Repair Settling Foundations in MN and WI! At DBS, we can identify and repair any issue you may be having with settling, sinking foundations. We have a wide variety of solutions for foundation repair that have been tested and proven effective throughout the United States and Canada through the Supportworks network of foundation contractors. Each of our solutions starts with a free, written foundation repair quote, and includes a personal consultation with a foundation expert, an in-person inspection, and a free copy of our 90-page foundation repair book. To schedule an appointment with one of our specialists, call or e-mail us today! 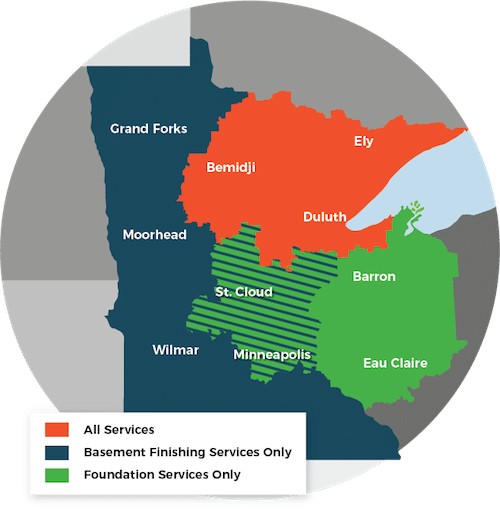 We proudly serve Superior, Duluth, Minneapolis, areas such as Hermantown, Two Harbors, Cloquet, Esko, Virginia, Ashland, St. Paul, and nearby.